But Yudina was an artist and personality of an absolutely independent character. She always went her own way playing against the established traditions and sometimes against the composers' instructions. She was breaking the rules but obeying the supreme laws of art according to which the artists of all times and nations were creating their works. Yudina often quoted Father Pavel Florensky who once said that one should not turn laws into rules because laws live while rules are static. So what is Sonata No 12 as interpreted by Yudina? It leaves an impression of an astonishing integrity and a profound consideration. The first movement goes a little bit slower than was usually played. Yudina takes the tempo of a quiet and majestic stalk and presents no expected diversity in variations (with the exception of the third one in the style of scherzo). Thus the whole peace manifestly corresponds with the Funeral March especially when it comes to the minor variation. The second movement is presented as a light, scherzo like piece. This quality of the music is achieved first of all by means of gracious dynamics and reappears in the Finale that astonishes the listener by a superfine play of light and shade. But the Funeral March is performed with mournful and sometimes tragic intonations. Trills in the left hand sound especially expressive. It arouses associations with the Funeral March from Sonata No 2 by Frederic Chopin. And then the Finale played with fantastic virtuosity rushes like the wind over the grave consolidates the association. 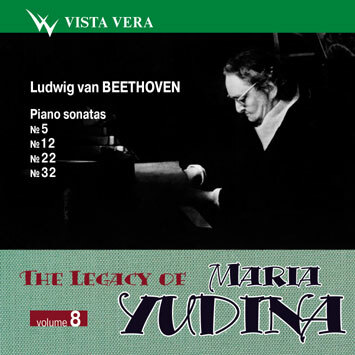 Yudina's interpretations of Beethoven's sonatas strike above all by a multi-dimensional image of each work, the entirety of the concept, very accurate details closely bound together, absolute sincerity, very high emotional and ethical tone. One can hear all this in small works like early Sonata No 5 and in a more extensive Sonata No 16 and in a monumental opus 111. In No 5, the impetuous first movement and restless finale both go very fast. Yudina's expressive means are precise and concise here. Her performance is full of energy and dramatic tension. And in between these two movements an elevated and laid-back molto adagio goes where slowly flowing time calls for meditation. Sonata No 16, on the contrary, is rich in charming details. Yudina generously scatters before us sparkles of her inexhaustible imagination.